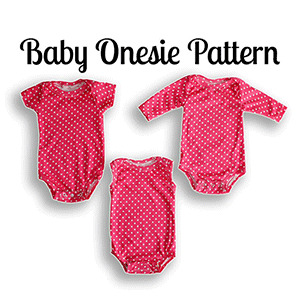 Sewing a whole stash of baby onesies couldn't be easier with this onesie sewing pattern. With no sleeves to cut or sew into place, no lapped shoulders to measure and only two pieces of binding to manuever, this is the fastest and easiest onesie sewing pattern available. The onesie fits great over disposable and cloth diapers (all of the pictures shown are with a cloth diaper). This pattern is available in sizes newborn to 36m. Suggested fabrics are cotton lycra, cotton ribbed, and cotton jersey.